Fiddler Voted Hubbell Designer Goldsmith’s Player of the Year. 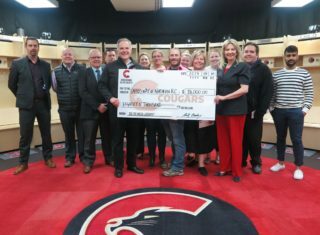 Saturday’s game between the Prince George Cougars and the Kamloops Blazers was one that 20-year-old forward Todd Fiddler won’t soon forget. 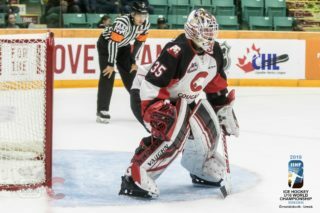 On a night where he was named the Hubbell Designer Goldsmiths Player of the Year (as voted by the fans) Fiddler also became just the second Prince George Cougars player to ever reach the 50-goal mark. 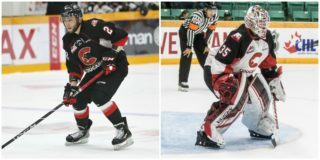 For the past two weeks, fans voted online at www.pgcougars.com for the Player of the Year Award. Contenders were the five winners of the Player of the Month award from September 2013 through February 2014. The five winners of the monthly award were: Ty Edmonds (September/October), Chase Witala (November), Jordan Tkatch (December), Todd Fiddler (January) and Troy Bourke (February). This year a record 14,228 votes were cast for the awards. 3,281 fans voted for the Player of the Year award, with Fiddler receiving an impressive 40% of the total. Todd Fiddler was recognized during a red carpet ceremony prior to the start of Saturday’s game with the presentation of a 14kt gold, handcrafted ring, created and presented by Darrell Hubbell. Acquired in an October trade with the Moose Jaw Warriors, Todd Fiddler arrived in Prince George and immediately took flight. After starting the season with just two goals and 10 points in 14 games, Fiddler exploded with eight goals and 17 points in his first 11 games with the Cougars. His best month came in January when he scored 16 goals and 29 points through 14 games. His January accomplishments helped earn him WHL Player of the Month honors. February was another successful month for Fiddler as he scored 12 goals and 24 points and finished with at least one point in all 13 February games. His point streak would ultimately last 19 games giving him the second longest point-streak in the WHL this season. Heading into Saturday’s game, Fiddler had 46 goals and was tied for the second highest single-season goal total in team history. He struck twice in the second period and once more early in the third to give him 49 on the season with a little less than 15 minutes remaining in the game. 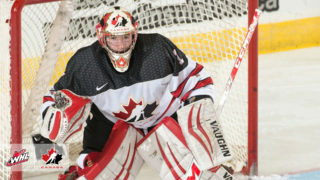 Goal number 50 came at the 15:50 mark of the third period after he was able to tuck home a rebound through the legs of Kamloops goaltender Bolton Pouliot. Fiddler now joins Quinn Hancock as the only other Prince George Cougar to ever reach the 50-goal mark. Hancock’s franchise-high 54 goals came in the 1997-1998 season. Todd Fiddler finished his WHL career with 127 goals and 241 points in 280 games. 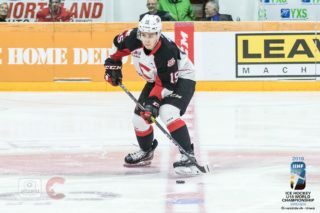 After Saturday night’s game he hinted that he hopes to sign on with a professional team and continue his hockey career for as long as possible. The Cougars wish to congratulate Fiddler on his many accolades during the 2013-2014 season and also wish to thank all of the fans who logged on and voted in the Hubbell Designer Goldsmiths Player of the Month polls this season.